Sadly there are those who, more motivated by money than welfare, are selling kittens that are sick and often far too young to be separated from the mother cat. 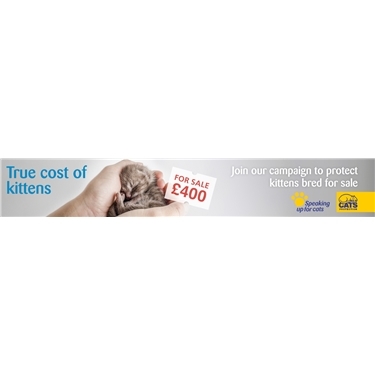 Buyers report paying hundreds of pounds to private sellers for kittens that are ill and/or under eight weeks old (the minimum age kittens should leave the mother cat). The true cost of a kitten to a purchaser can be the heartbreak of buying a kitten that becomes sick – and in some cases dies – and facing significant vet bills. The Government is reviewing the law governing the sale of pets for the first time in over 60 years. Cats Protection wants better safeguards for the commercial sale of all types of cats across the board whether they are non-pedigree ‘moggies’ or pedigrees. We know that there are responsible sellers out there and that good practice and high welfare standards exist. Membership organisations like the Governing Council of the Cat Fancy (GCCF) that register pedigree breeds and advise on welfare recommends that no kitten should be permitted to go to a new home before 13 weeks of age when they will have had a full course of vaccinations.